So you have sifted through all your files, purged and plundered mounds of paperwork and pulled out all the documents you will need for your tax return. Congratulations! Now you need to figure out a system for storing and preserving the files you have left. The file storage system you choose should address how many files you are storing, how often you need to access those files and where you plan to store your files. If the storage area you have planned for your files is in a musty basement, you'll want to take that into consideration when choosing your file storage containers. How Many files do you have to store? If you only have a folder or two for each year, you may simply need to keep a portable or desk top file holder on or near your desk to store the papers in. Categorize your files by year. If you have many files for each year, you will need to find enough free space to accommodate the larger mass of paperwork and find appropriate storage boxes that you can organize by year. Place a prominent label on the outward facing end of each box. I use a Sterilite Show-Off tote to hold my bills for the year. It's great for holding hanging files! I have them separated into categories. When the year is over, and after I have done my taxes, I move the papers I plan to keep to more permanent storage. How Often will you need to access your files? If you constantly need to access your files, you'll want to store them somewhere that is easily accessible. If your office workspace is on the top floor, you don't want to walk down flights of stairs every time you need to get a file. File boxes that need to be frequently accessed should not be stacked. Keep them on a shelving unit in single height rows. This makes them easy to find, easy to open and easy to put away. If you won't be needing your files for a long time, you can seal them up tight, label them well and stack them in a dedicated, protected place. 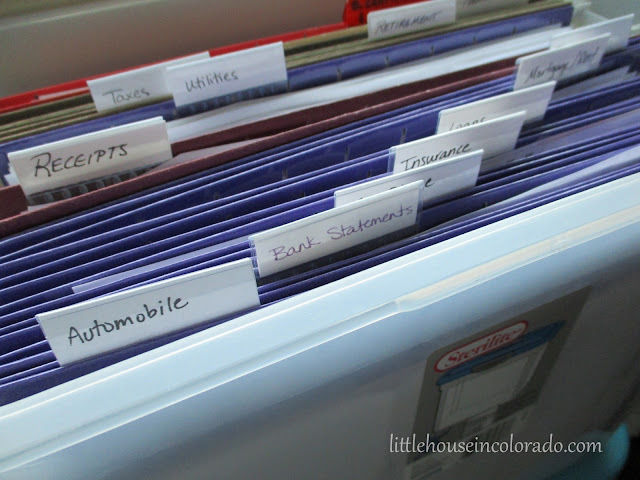 Be sure the label is facing out so if you ever need to refer back to an old file, it will be easy to find. Where do you plan to store your files? If the storage area you have planned for your files is in a musty basement, you'll want to take that into consideration when choosing your file storage containers. Cardboard file boxes just won't do! Find boxes that will provide a protective moisture barrier like Iris Stor-N-Slide file boxes. If you are going to store your files on the top shelf of the spare bedroom, choose smaller containers that you can reach and pull down by yourself. Open files on a shelf are perfect for smaller quantities and are safe in the climate controlled conditions. They can also be easily accessed at any time.